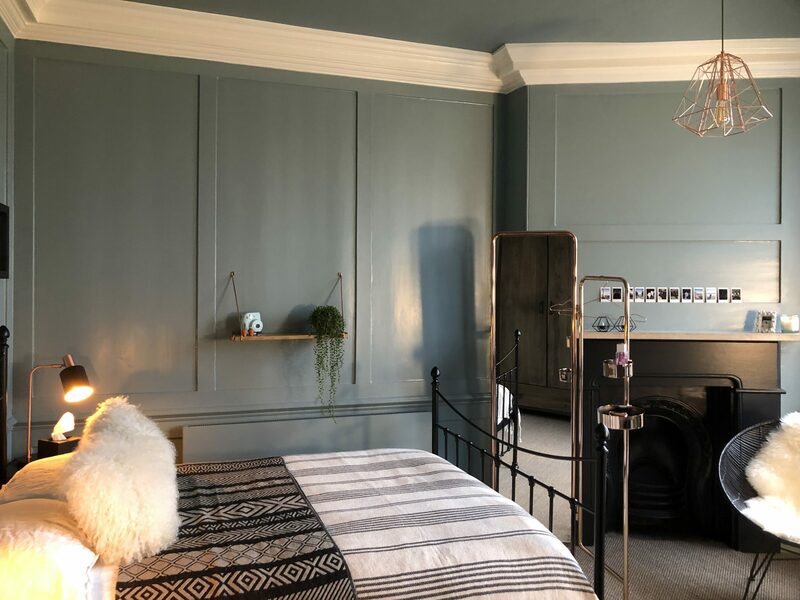 Look Inside an Inspiring Grade 2 Listed Georgian Home in Richmond | The Decor Cafe | Interiors. Gardens. Lifestyle. Home business. Built on the site of a sixteenth century farmhouse, it is formed in two parts. Two-thirds of the house is Georgian, from 1732, and the remainder a Victorian side extension added in 1853. The childhood home of Diana Thompson, the property had been occupied by squatters and was in a terrible mess when the family moved in. Piles of possessions had been abandoned and remained from the earliest of times. The wine-merchant left bottles, the blacksmith horseshoes and the dressmaker pins under the floorboards. Even the original farmhouse door was found in the basement. Once a solicitors office, marble-effect wallpaper remains in the hall. In 1911 it was purchased by Richmond council and turned into a registry of births and deaths. It was a probation office and a school of art and music. 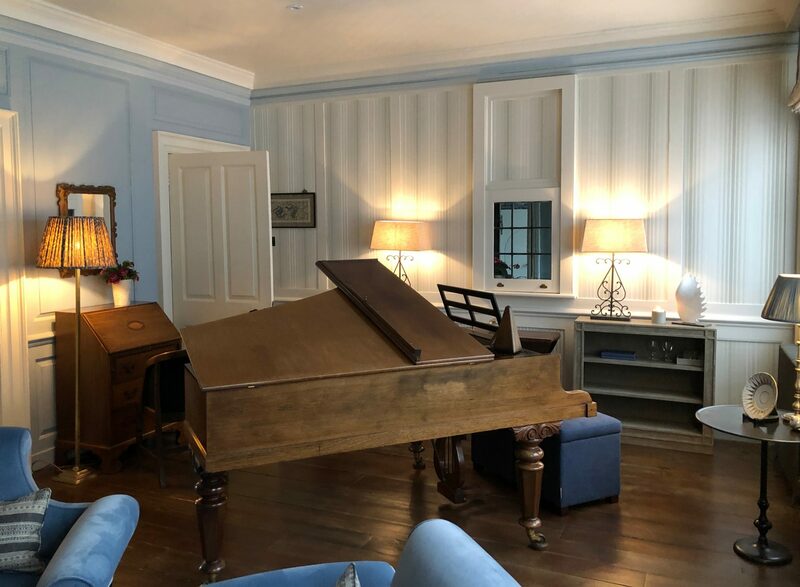 Photos show a grand piano in the centre of the main living room – exactly where the family have placed their, almost identical, piano today. Restoration was begun by Diana’s architect Father in the 1970’s and, after his death, she agreed a home-swap with her Mother and moved back in to continue the process. Diana has experience of building projects, having already renovated the basement with her Father, but wanted help with the interior design. She appointed Ann Jackman and together they approached the project one room at a time. Starting with the kitchen, Diana found a new home for the existing 70’s pine. 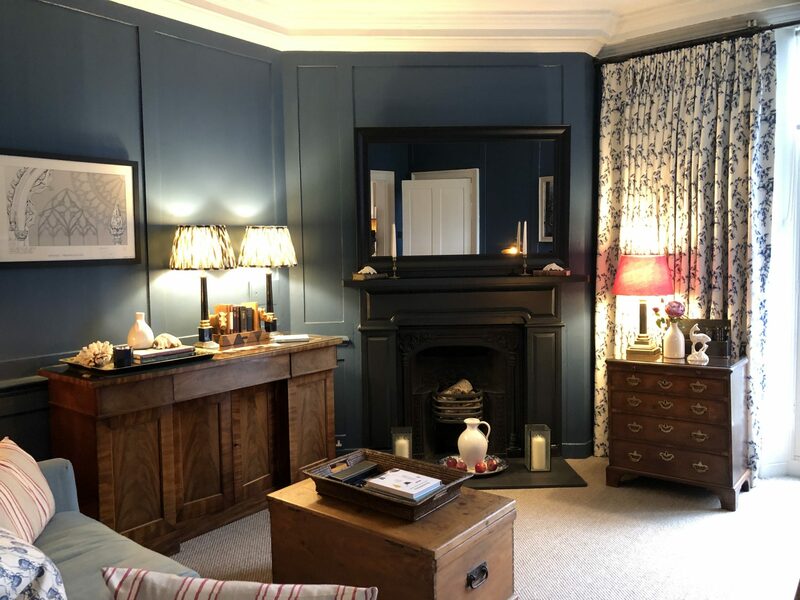 She chose units more suitable for modern family living and in-keeping with the beautiful 17th century tiles in the fireplace. Space was left for French doors to replace the sash window, to lead down into the garden, once listed building permission is agreed. The bathroom was next. 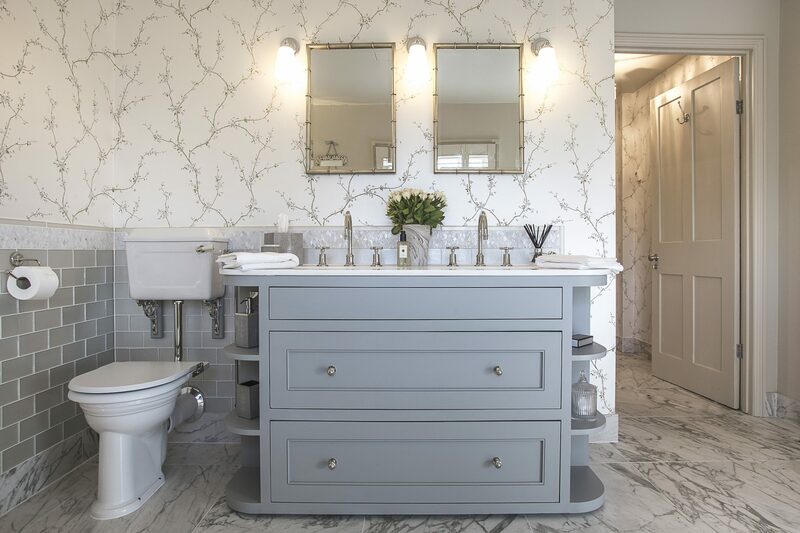 The space was reconfigured to allow for a separate utility room behind the wash-basin wall. New shutters were fitted and the bath placed to give a view onto the garden. 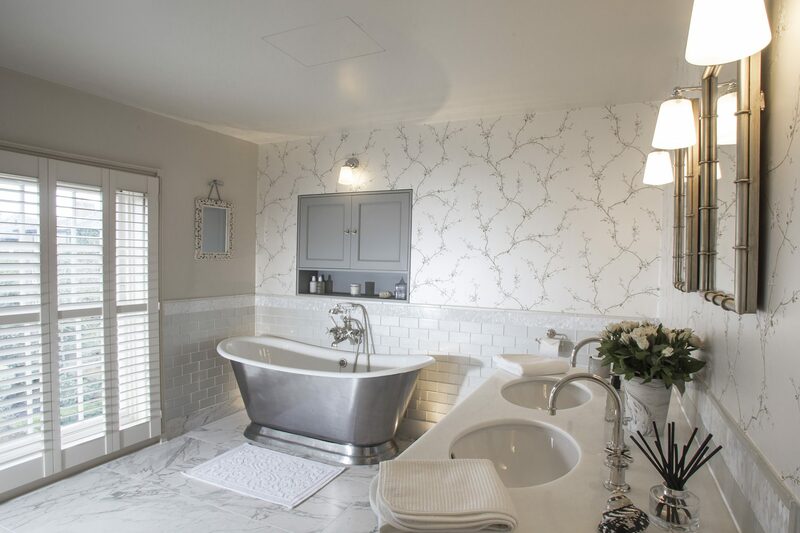 Marble effect porcelain Fired Earth tiles were chosen to work with the newly installed underfloor heating. The plumbing and electrics are an ongoing project in all areas of the house. The bathroom cabinet was built bespoke. Next, Ann and Diana focussed on the main living areas. The soft palette of blue, grey and silver threads throughout the house. The music room incorporates the original hatch out onto the hall that was used to receive visitors when the house was still a council building. The paper is from Zoffany, the chairs from Lutyens Contemporary and the cupboard and lights from Oka. 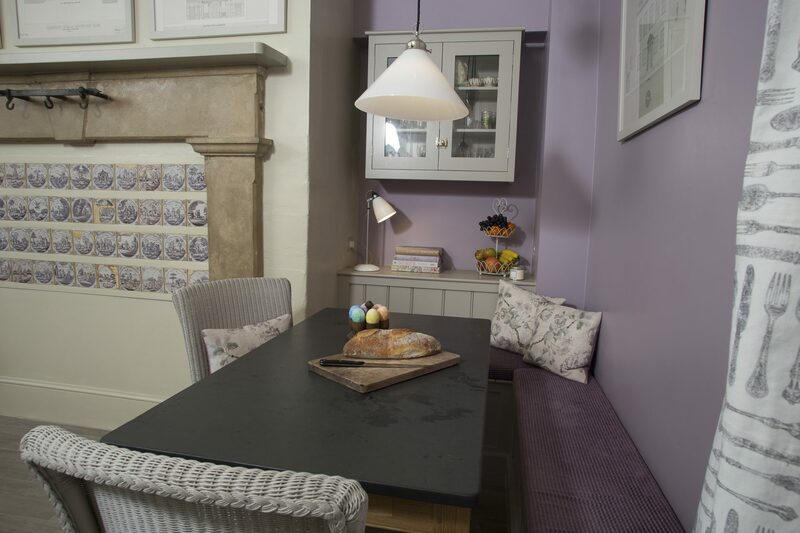 The family room used to be painted off white but Diana was keen to create a richer colour scheme. Her bold decision paid off. This has become the favourite room in the house. You would never know that the TV is placed above the fireplace. It is from the Picture Frame TV company. The curtains pull back to one side to maximise the light and space and also perform the useful function of covering pipes. 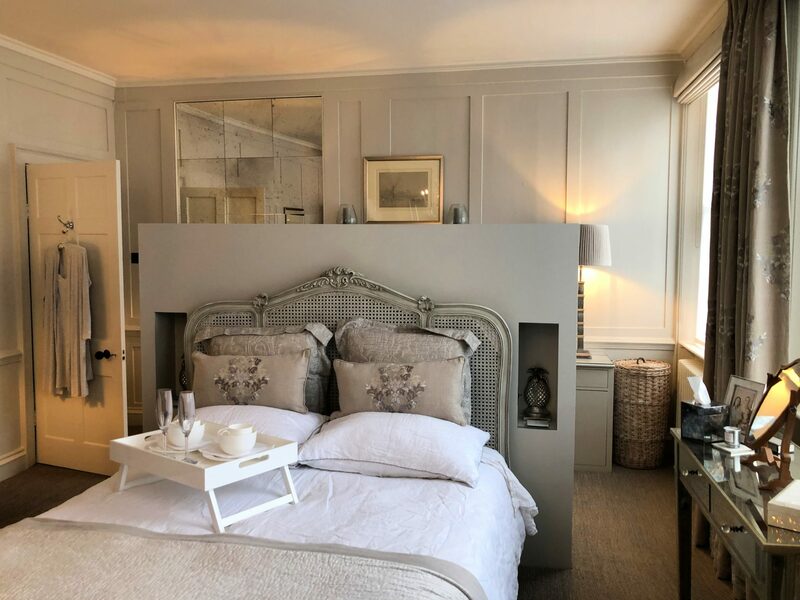 Upstairs, the master bedroom is designed to capture the look and feel of a boutique hotel. Diana wanted a separate area for her husbands papers and so had the idea to add a false wall behind the headboard. A cabinet was purpose-built to file all his papers and may be used as a dressing area in the future. The windows were dressed with privacy blinds, combined with Roman blinds and dress curtains to achieve the desired layers of luxury. The original wardrobe doors were hand-painted by Hannah Eustace in a specialist paint effect. 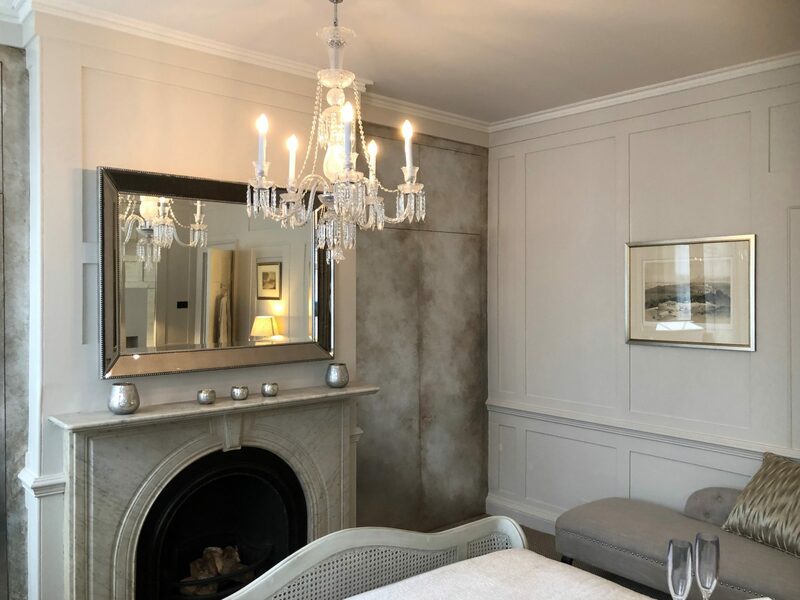 A chaise and chandelier were added and the pictures were reframed to compliment the scheme. Diana’s teenage daughter has a talent for interior design and had strong ideas of her own for her bedroom. She gave Ann a very clear brief of copper, blue and black. 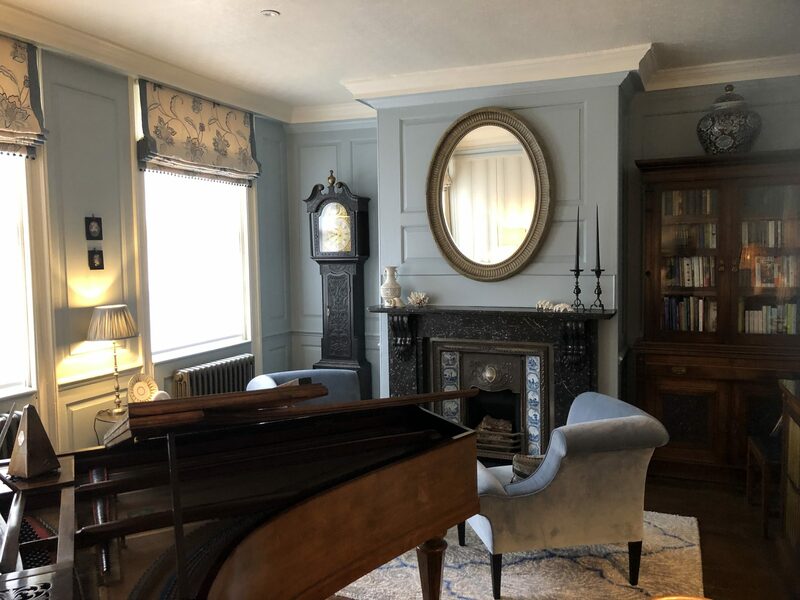 The walls and ceiling are painted in Farrow & Ball Oval Room Blue. The furnishings are from made.com, Maisons du Monde and Cox & Cox. Work is still in progress, with plans to do more bedrooms next. If you would like to find out more about the history of the house Richmond Museum has a section dedicated to the property, originally researched by Diana’s architect Father. Ann has proved her worth many times over. She is a joy to work with and knows how to get the best out of the numerous people involved in the project. She’s great at project management, getting the work completed and has very high standards. She has an amazing eye and colour sense. 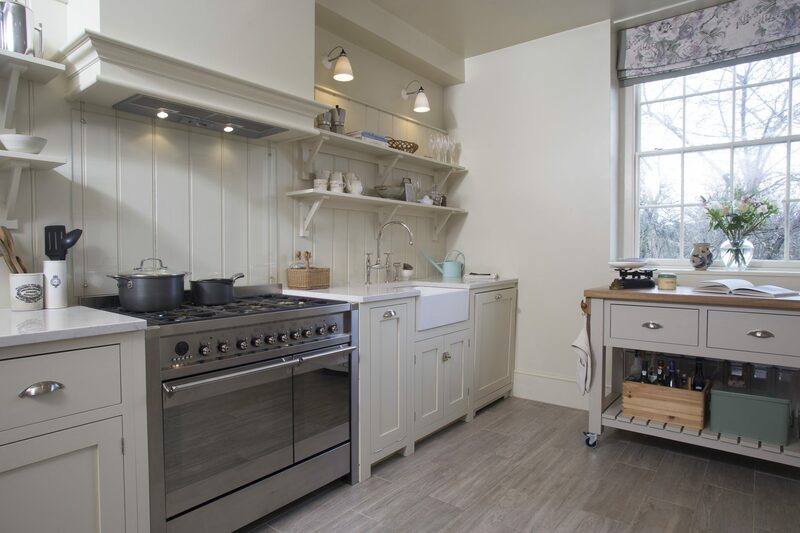 Many times she has sourced fabrics, paint colours, and even the kitchen supplier, that have skilfully anticipated what I love, often before I know it myself. I was told very early on that I was ‘lucky to have her’, and I can see why! I walk past this house most days and could never have imagined what a treasure lay behind the facade .The renovation to this historic property was amazing and so refreshing to see so many original features incorporated in the updated design. Diane and Ann should be extremely proud of what they have achieved and thank you so much for giving us the opportunity to see your stunning home.